Vyākaraṇam or Grammar is one of the six Vedāṅgas and considered as the mouth of Vedapuruṣa (Veda personified). It is also called Śabdānuśāsanam. Unlike the Grammar of any other language, Vyākaraṇam of Sanskrit language is associated with philosophy. Literally, the term Vyākaraṇam means an instrument that separates (perfect) Śabdas from Apaśabdas (imperfect Śabdas). Dharma can be achieved by employing perfect Śabdas and the imperfect Śabdas cause Adharma. Just like any other Vedāṅga, Vyākaraṇam also would help one attain Mokṣa (liberation from the cycle of birth and death). The term Śabda is untranslatable as it denotes the following: varṇa (phoneme), prakṛti (nominal and verbal root), pratyaya (suffix), padam (word), vākyam (sentence), avāntaravākyam (sub-sentence), mahāvākyam (discourse), dhvani (sound) etc. Vyākaraṇam is not Grammar (parts of speech etc.) but more than that. It is a rough translation. Vyākaraṇam is considered to be the most important among Vedāṅgas as it is the base of all disciplines. For that matter, Grammar is the backbone of any language and literature. ओंकारं पृच्छामः – को धातुः? किं प्रातिपदिकम् ? किं नामाख्यातम् ? किं लिङ्गम् ? किं वचनम् ? का विभक्तिः ? कः प्रत्ययः ? कः स्वरः ? etc. oṃkāraṃ pṛcchāmaḥ – ko dhātuḥ? kiṃ prātipadikam ? kiṃ nāmākhyātam ? kiṃ liṅgam ? kiṃ vacanam ? kā vibhaktiḥ ? kaḥ pratyayaḥ ? kaḥ svaraḥ ? pṛcchāmaḥ = let us ask, oṃkāram = Omkāra, kaḥ = which one is, dhātuḥ = verbal root? kim = what is, prātipadikam = nominal root? kim nāma = what is meant by, ākhyātam = a verb? kim = what is, liṅgam = gender? kim = what is, vacanam = number? kā = which one is, vibhaktiḥ = case? kaḥ = what is meant by, pratyayaḥ = suffix? kaḥ = what is meant by, svaraḥ = accent? Let us take up the word ‘om’ – what is the verbal root? and nominal root? what is meant by verb, gender, number, case, suffix and accent? Moreover, svara (accent) is mandatory in Veda and any change in svara would cause change in meaning. On the other hand, although svara is common to both kinds of Śabdas, people do not employ the same in Loka (secular). Another significant point is that there is free word order in Loka whereas in Vedic literature the order of words is prescribed. Before Pāṇini entered the scene, there used to be two separate Vyākaraṇams – the one exclusively useful to analyze Vaidikaśabdas, called Prātiśākhya and Vyākaraṇams meant for the analysis of Laukikaśabdas, such as Ṛkprātiśākhya etc. for Vedas, and Aindravyākaraṇam for Loka. It was Pāṇini considered to be the most genius person on earth, who put the contents of both Prātiśākhya and Vyākaraṇam in a nutshell called Aṣṭādhyāyī (a treatise containing eight chapters). Thus, Pāṇini’s Vyākaraṇam became a Vedāṅga. Aṣṭādhyāyī consists of about 4,000 Sūtras (elliptical sentences with economy of letters) and the Sūtras are supported by Vārtikas (sentence of amendment) by Kātyāyana et al. Patañjali, a great sage, authored Mahābhāṣyam (the great scholium), a vast and profound commentary on Aṣṭādhyāyī. 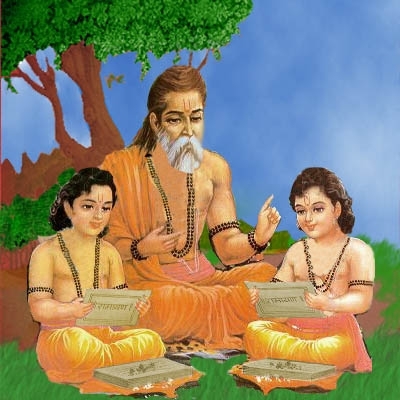 Since Pāṇinīyam (Pāṇini’s grammar) is based on the trio of Sūtra, Vārtika and Bhāṣya of Pāṇini, Kātyāyana and Patañjali, it is called “Trimuni Vyākaraṇam” (Grammar of the three sages). There are three kinds of defects related to body, speech and mind and, it is believed that Patañjali, in order to obviate the defects, authored Carakasūtram (Āyurveda), Mahābhāṣyam and Yogānuśāsanam. The study of Mahābhāṣyam is considered on a par with ruling of a great empire. वेदानां रक्षा, vedānāṃ rakṣā (protection of Vedas) – The Vedic literature, which is a mass of knowledge and non-human (apauruṣeya) has to be protected in terms of the form of Śabda, accent, sandhi (morphophonemics) etc. A non-vaiyākaraṇa (non-grammarian) cannot do this job. Therefore, in order to protect the rich and invaluable Vedic literature, inherited from sages one should study Vyākaraṇam. लघुः उपायः, laghuḥ upāyaḥ (an easy device) – Thousands of Śabdas cannot be committed to heart. Vyākaraṇam is an easy device to know the gamut of Śabdas. मोक्षः, mokṣaḥ (Arresting the cycle of birth and death) – Vyākaraṇam is considered not only as a Vedāṅga but also as a Darśana on a par with Vedānta etc. that is useful in attaining Mokṣa, the ultimate goal of a human being. Therefore, Vyākaraṇam is considered as a highway to reach Brahman (Mokṣa). One would get Dharma (that leads to Mokṣa) by employing Śabdas i.e. perfect Śabdas, which are acceptable to Vyākaraṇa, with the knowledge of Vyākaraṇa. Although, there is no hitch, in terms of transformation of meaning, by employing Apaśabdas (imperfect Śabdas or those not acceptable to Vyākaraṇam), it is Dharma one has to forego. गौः (gauḥ) is the Śabda. गावी (gāvī), गोणी (goṇī), गोता (gotā), गोपोतलिका (gopotalikā) etc. are Apaśabdas employed to express the same sense. बाधा (bādhā) is the Śabda; भाधा (bhādhā), भादा (bhādā), बादा (bādā), are Apaśabdas. भेदः (bhedaḥ) is the Śabda. भेधः (bhedhaḥ), बेधः (bedhaḥ), बेदः (bedaḥ) are Apaśabdas. And the Apaśabdas are not limited in number. They may also vary from house to house, village to village etc. If one wants to compile a Vyākaraṇam then he can list either Śabdas or Apaśabdas. There too, since the number of Śabdas is less and limited, it is wise to offer a list of the same and the implication is that the rest are Apaśabdas. Further, cataloguing all the Śabdas of a language like Sanskrit, which is rich in vocabulary, is an impossible task. Therefore, Pāṇini followed the ‘general-exception-rule’ system. A general rule is made and wherever there are exceptions another rule is made for them. Pāṇini is not creator (स्रष्टा, sraṣṭā) of Śabdas. Rather, he is a registrar (स्मर्ता, smartā), i.e. one who collects the information and records. Therefore, Pāṇini, with his Yogic capacity (योगशक्ति, yogaśakti), could discern the gamut of Śabdas across 1,137 branches of Veda and a vast literature of Loka, i.e. Upavedas, Vedāṅgas, Darśanas, Purāṇas etc. and such an exceptional sage compiled an exceptional work called Aṣṭādhyāyī. So, if there is usage (प्रयोग – prayoga) either in Veda or Loka, then only one can analyse such a Śabda through Vyākaraṇam – this is what is meant by प्रयोगशरणं व्याकरणम् (prayogaśaraṇaṃ vyākaraṇam), i.e. usage is the resort of Vyākaraṇam. When people can have Vaidikaśabdas from Veda and Laukikaśabdas from Loka, why Vyākaraṇam? Language changes by nature and it is not feasible to compile a Vyākaraṇam for any language. Therefore, if and only if the Śabda, the Artha (meaning) and the Sambandha (relation) between them is immutable, then only it is feasible to compile a Vyākaraṇam. Following the above norm, the trio of Pāṇini, Kātyāyana and Patañjali compiled the Vyākaraṇam which has got two hallmarks, viz. brevity (lāghavam) and perfection (nirduṣṭatā) and the same made Pāṇinīyam popular across the globe. This is how and why Sanskrit has become the only language that is suitable to computers. So, Vyākaraṇam, following the usage prescribes the Śabdas and usage of such Śabdas, with the knowledge of Vyākaraṇam, would fetch Dharma. In other words, unlike other languages, usage of a Sanskrit Śabda, in the said fashion would get two things – transformation of meaning and Dharma. Needless to say, Dharma would lead to Mokṣa. i) a i u ṇ ; ii) ṛ ḷ k ; iii) e o ṅ ; iv) ai au c ; v) ha ya va ra ṭ ; vi) la ṇ ; vii) ña ma ṅa ṇa na m ; viii) jha bha ñ ; ix) gha ḍha dha ṣ ; x) ja ba ga ḍa da ś xi) kha pha cha ṭha tha ca ṭa ta v ; xii) ka pa y ; xiii) śa ṣa sa r ; xiv) ha l .
One can make a number of Pratyāhāras (abbreviations) out of the Sūtras and achieve economy by not uttering each letter. The last letters are meant to make Pratyāhāra and therefore are not to be counted. Such a letter is called technically called ‘it’. The letter ‘ha’ is uttered twice keeping a specific grammatical application in mind. The Pratyāhāra ‘al’ means any letter, i.e. ac or hal. Since a, i, u, ṇ etc. are useful in creating designations such as ak, ac, hal etc. they are called Saṃjñāsūtras (aphorisms for designation). ‘Do not kill a cow’ – means – do not kill any cow. Here, the word ‘cow’ in the sentence means the total number of cows on earth, i.e. the class of cows or Jāti. ‘Fetch a cow’ – means fetch a single cow. The word ‘cow’ in this sentence means a cow individual, i.e. a single cow or Vyakti. The Jāti of a cow is expressed by a suffix, viz. tva or ta – gotvam or gotā (cowness) and it is abstract. The Jāti has got the Vyakti as its resort, i.e. if one wants to know Jāti, it is available in a Vyakti only. Similarly, one cannot find a Vyakti devoid of Jāti. In other words, Jāti and Vyakti are nāntarīyaka (inseparable). This concept is universal, i.e. applicable to all languages. Gotvajāti is available only in a cow and a cow devoid of Gotvajāti is not available. Pāṇini employed the technic of Jāti and Vyakti in his Aṣṭādhyāyī. In the Māheśvarsūtra, ‘a, i, u, ṇ’, ‘a’ means the Jāti of ‘a’, which means the eighteen types of ‘a’ – अ (a – hrasva / short), आ (ā – dīrgha / long), अ३ (a3 – pluta / longer), अ (udātta / anudātta / svarita), अ (non-nasal) and अँ (nasal). Thus a total (3 x 3 x 2) of eighteen akāras (the letter a) are taken care of by a single ‘a’ due to Jāti. Such is the economy of Pāṇini. If Pāṇini wants to denote a short ‘a’, then he say ‘at’, for the long one ‘āt’, i.e. he adds ‘t’ to the specific letter so that Jāti is not applied. This process is called ‘taparakaraṇam’ (adding ‘t’ to the letter). Jāti (Class) – The word gauḥ denotes gotvajā Due to nāntarīyakatva (inseparability) the vyakti is also denoted simultaneously. Guṇaḥ (attribute / property / qualifier) – ‘śuklā gauḥ’ (a white cow) – here ‘śukla’ is a Guṇa. Kriyā (activity) – pacati (cooking) is a word that denotes a ‘kriyā’. Saṃjñā (name or designation) – Rāma is the name of a person. All the above four, i.e. Jāti, Guṇa, Kriyā and Saṃjñā are available associated with a Vyakti. Vyākaraṇam is often referred to by the term Śabdānuśāsanam, which literally means a treatise that prescribes Śabdas by vividly offering their structure, i.e. root, suffix etc. As has already been stated, the term Śabda denotes a number of things such as varṇa (phoneme / letter), prakṛti (root), pratyaya (suffix), padam (word), vākyam (sentence), avāntaravākyam (sub-sentence), mahāvākyam (discourse) etc. and hence could / should not be translated. Pāṇini’s Vyākaraṇam deals with all the said elements. Vākyam (sentence) is the unit of language. Where are you coming from? ‘Hostel’. Here the answer, i.e. hostel, is an elliptical sentence. ‘I’, ‘am’, ‘coming’ and ‘from’ are ellipses. Therefore, even if it is a single word, be it noun or verb, if it conveys a complete sense then it is (an elliptical) a sentence. 15. How to Compile Vyākaraṇam? Cataloguing all the sentences employed is simply impossible. Even the words are innumerable to list. Therefore, the founders of Vyākaraṇam have come down to the combination of prakṛti (root) and pratyaya (suffix). By adding a number of Pratyayas to a single root one can easily produce many Śabdas. While analyzing the Śabdas, Pāṇini first makes a general rule such as “karmaṇi aṇ (Aṣṭādhyāyī 3-2-1)” – if a verbal root is preceded by a word in accusative case then there will be the suffix ‘aṇ’. Kumbham (a pot) karoti (producing) – kumbha + kṛ + a = kumbhakāraḥ (a potter). In cases where aṇ is not applicable he makes an exceptional rule – “ātaḥ anupasarge kaḥ (Aṣṭādhyāyī 3-2-3)” – if the verbal root is ending in ā and not prefixed with an upasarga (pra, parā etc.) then there will be the suffix ‘ka’, in the same context. pra, parā, apa, sam, anu, ava, nis, nir, dus, dur, vi, āṅ, ni, adhi, api, ati, su, ut, abhi, prati, pari, upa. Liṇgānuśāsanasūtrapāṭhaḥ – is a group of Sūtras which help in deciding the gender of Śabda by the suffix etc. Gaṇapāṭhaḥ – It is just like a dictionary of words with the same suffix. The words ending with the same suffix are grouped and called a gaṇa (group). Śikṣā – Pāṇini authored a Śikṣā, one of the Vedāṅgas, dealing with pronunciation etc. With Aṣṭādhyāyī, Pāṇini authored five works for Vyākaraṇam. Apart from the above, Pāṇini took ‘Uṇādisūtras’ of Śantanumaharṣi, that are useful in producing Śabdas. (verb) is called Tiṅ – bhū + ti = bhavati. The above procedure is called Morphology (Science of a Word). Padaśāstram is another synonym of Vyākaraṇam. According to tradition a scholar must have deep knowledge of Padavākyapramāṇaśāstras (Vyākaraṇam, Mīmāṃsā, and Nyāya). Sandhi (Morphophonemics) – This is called Phonology. When two letters are pronounced in quick succession, it is called sandhi and the result is phonemic change (phoneme = letter) – gaṅgā + udakam = gaṅgodakam (water of Ganges). Kārakam (Dealing with Syntax) – The Kāraka theory deals with the analysis of a sentence. Kāraka is the semantic expression and is represented by a vibhakti (case) at syntactic level. Kartā (doer / subject / agent), karma (object), karaṇam (instrument), sampradānam (the person at the receiving end), apādānam (the thing from which something parts) and adhikaraṇam (the base) – are six Kārakas. rāmaḥ vanam gacchati (Rama is going to forest). In the above sentence ‘rāmaḥ’ is kartā and ‘vanam’ is karma. Ṣaṣṭhī (possessive case) is not considered as a Kārakam because it denotes the relation between two things (nouns) – rājñaḥ puruṣaḥ (the king’s servant). Pāṇini analyzed ‘discourse’ (Mahāvakyam) also. Āryāvarta – Any Śabda not touched by Pāṇini but is used by Āryas can be taken as authoritative – says Pāṇini (6-3-109). Āryas were the people residing in ‘Āryavarta’, the place surrounded by Himālayas (North), Vindhyas (South), Prayāga (East) and Kurukṣetra (West).